Tag Archives: All Natural … Really? The processed food industry’s definition of “All Natural” defies common sense. Shop organic: Organic certification assures that the birds receive organic feed, have access to the outdoors, and are raised without antibiotics or growth-enhancers like Roxarsone and Topmax. Shop local: Smaller, local farms usually employ more sustainable practices that can be better for your turkey and the environment. Even if these farms aren’t certified organic (since getting certified can be costly), it’s probably a better choice. Over the past 5 years of my food journey, I’ve learned that it’s a good idea to get to know your farmer and where you food comes from! Find a “heritage” turkey: What’s a heritage turkey? Heritage turkeys are what turkeys were before Big Ag started industrializing production with big, broad-breasted birds that are anything but natural. In fact, did you know that industrial turkeys can’t reproduce naturally, they can barely walk, and their narrow gene pool makes them very susceptible to disease? In contrast, heritage turkeys are from strong genetic stock, and they’re raised outdoors with plenty of grass and sunshine. If you’re interested, the Naragansett and Bourbon Red varieties are two great heritage turkey options. For my Thanksgiving this year we’re serving a Bourbon Red turkey from a local farm called Little Bend Heritage Farm (sorry, they’re already sold out of turkeys for 2014). Ditch the pre-basted turkey: To help you out I did some research and called the Butterball hotline to see if they have any non pre-basted options. Unfortunately what I learned wasn’t great news. First, all of their turkeys are pre-basted. For their regular (not “all-natural“) turkeys that means they’re injected with water, salt, spices, sodium phosphate, and modified food starch. As I discussed in my post about rotisserie chickens, the overuse of phosphates in our food is being linked to some serious health conditions. So I’d avoid these turkeys at all costs. Butterball’s so-called “all natural” turkeys skip the sodium phosphate and modified food starch additives, but they’re still industrialized birds, and they’ve been injected with water, salt, and spices. I realize we’re all in different circumstances and places on our real food journey, but if at all possible, I’d try to avoid these highly commercialized birds. Processed Food: Trick or Treat? Here’s a fun, yet scary post in honor of Halloween. Although it’s meant with a little tongue in cheek, it is alarming what the food industry can get away with putting in their boxes, bags, and bottles without us even knowing it. Enjoy! These verses uttered by the Three Witches in Shakespeare’s Macbeth have become legendary, and the weird ingredients they talk about make us shake our heads in disgust. But at least we know what’s in the witches brew. The same can’t be said for most of the foods in our modern-day grocery store. Unfortunately big food companies have cast a spell over most regulators that allows them to manipulate us with advertising, make deceptive claims, and mislead us with ingredient labels. Cow’s Stomach: Known as rennet and derived from the mucosa of veal calves’ fourth stomach, this ingredient is frequently used in the production of cheese to curdle the milk. Often listed simply as “enzymes” on an ingredient panel, it can be very hard to know exactly what you’re eating when you buy cheese. If you’re looking to avoid rennet, look for vegetarian or kosher certified cheeses. Hair and / or feathers: Called L-cysteine or cystine by the processed food world, this non-essential amino acid is made from human hair or duck feathers and is used as a dough conditioner to improve the texture of breads and baked goods. Again, since cystine comes from natural sources, you can eat “natural” and still have hair in your food. Beetle Juice: No, I’m not talking about the 1988 movie starring Alec Baldwin and Geena Davis. This beetle juice is used in our food and is often called shellac, resinous glaze, or confectioner’s glaze on ingredient labels. Made from the secretions of the female lac bug, this substance is scraped from trees and branches then processed to be used on some of your favorite shiny candies and sprinkles. Crushed bugs: Known as Carmine, Crimson Lake, Cochineal, or Natural Red #4 on ingredient labels, this red food coloring additive is made from insects like the cochineal beetle. Frequently used in yogurts and beverages to give them a ruby-red color, a cochineal beetle can be a tough to spot on ingredient labels since it can be listed as a natural color. All of our natural flavorings are vendor supplied and are therefore proprietary information. We do not explicitly use castoreum. We cannot speak for our vendors that provide proprietary ingredients such as natural flavors. I want to assure you that the FDA does consider this ingredient as generally recognized as safe. Do you believe that? I know I don’t. Food manufacturers know exactly what’s in their food, even if the flavoring comes from another supplier. Furthermore, they can expressly ask flavor suppliers to NOT use specific ingredients. But the bottom line is the food industry doesn’t want you or I to know the whole truth. That would hurt their business. So in honor of Halloween, I’ve come up with a few new lines for Shakespeare’s Three Witches. And just as these witches’ prophecies foretold Macbeth’s downfall, if we all speak up, the processed food industry will be in for some real change. Beetle juice shines food like glass. Hair and feathers condition our bread. Yes I’m scared of these mysteries. Lying and deceiving is no game. We’ll fight to know what we eat. It’s time to regulate all this stuff. As always, if you’ve enjoyed this post, please share it by pasting a link on your Facebook wall, liking it, or emailing it to a friend. If you have a chance and would like to learn more about my novel, Fat Profits, click here. And for more inside scoop on the world of food, please subscribe to my blog. In honor of Halloween, I’m sharing this Halloween post from last year (originally published on October 30, 2011.) Believe it or not, it’s been my most popular post to date. Crazy! Simple is Always Good, Right? Food companies are some of the savviest trend spotters around. They literally spend Hundreds of MILLIONS of dollars tracking and following trends. In fact, in some cases, they even help create the trends. Why? It’s all in hopes of selling more and more food. But when simple foods and short ingredient lists became the latest trend, did Big Food run scared? No–they did just the opposite. LIke a chameleon, they quickly adapted and turned the trend to their advantage. Does that mean our food is really simpler? In some cases, yes. But more often than not, Big Food has merely hijacked this trend and leanwashed the truth so it can sell more food. Don’t believe me? Let’s take a look at a real life example to see Big Food hard at work. Higher levels of IGF-1: IGF-1 is a hormone that allows certain cells to grow. As the American Cancer Society reports, “Several studies have found that IGF-1 levels at the high end of the normal range may influence the development of certain tumors.” Although the scientific evidence is inconclusive at this time, the American Cancer Society goes on to say “more research is needed to help better address these concerns.” I don’t know about you, but I’d rather this research be done before a product is invisibly foisted into our food supply and called natural and simple. What do you think? Milk of lower nutritional quality: During certain periods of lactation, the milk produced by dairy cows treated with rBGH has decreased levels of proteins and higher fat content, indicators of lower quality. More pus in milk: Cows treated with rBGH endure many harmful side effects including mastitis, an infection of the udder. These infections lead to not only more pus in our milk, but also the increased use of antibiotics to ward off infections. Call me crazy but pus and antibiotics are two things I’m trying to cut back on in my diet. Canola Oil is the second ingredient that caught my attention. Although billed as a natural, heart-healthy oil, the truth is the majority of canola is derived from genetically-modified rapeseed. If GMO concerns aren’t enough to make you blink, then consider this: most commercially produced canola oil is very highly processed and undergoes intensive manufacturing steps like being refined with hexane and then bleached. Does this sound simple or natural to you? 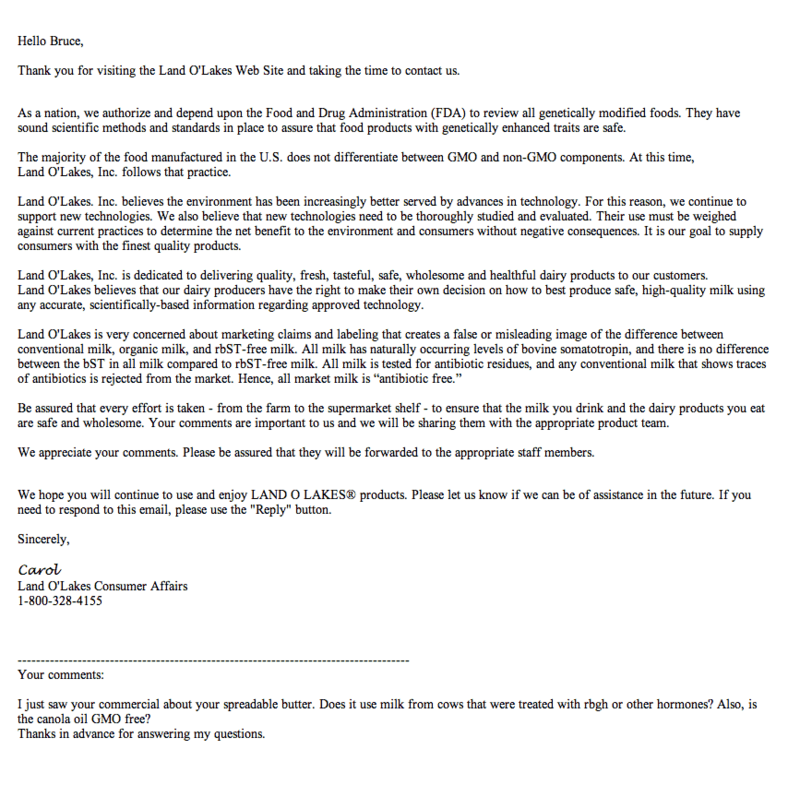 To confirm my suspicions, I emailed Land O’Lakes to see if its spreadable butter used rBGH treated milk and/or GMO canola oil. At first they dodged the question and instead blathered on and on with sentiments like this: “Land O’ Lakes, Inc. believes the environment has been increasingly better served by advances in technology.” [you can read the full text of their reply here] Finally, after asking again, I got this reply: “The ingredients used in LAND O LAKES® Spreadable Butter with Canola Oil are not hormone or GMO free.” Huh, it’s as simple as that. While Land O’ Lakes spreadable butter may not appear to have the long list of chemicals that are in most margarines, it’s not nearly as pure, simple, or natural as it pretends to be. So what can we do? Be vigilant, ask questions, and dig for the truth. You see, Big Food companies simply cannot be trusted to disclose all the information we want to know about our food. Although their disingenuous approach must change, for the time being we must assume that every time Big Food speaks, they are trying to sell us something, not provide us with the complete story. And if you’re looking for a little extra help, check out my series All Natural…Really? where I explore foods that pretend to be natural or simple. And how about your butter? Well if you’re looking for a replacement for your spreadable butter, here’s what I do. I buy organic butter. If I want some to be soft and spreadable, I use an old-fashioned butter keeper–you can find a wide selection of them online. As always, if you’ve enjoyed this post, please share it by pasting a link on your Facebook wall, liking it, or emailing it to a friend. And for more inside scoop on the world of food, please subscribe to my blog. Imagery has always been a very powerful tool in marketing processed foods. When regulations get in the way of what manufacturers want to say, the use of iconic symbols and imagery has helped them bypass most restrictions in their quest to elevate their products and obscure reality. One of the most compelling symbols in existence is the sun. Since the dawn of mankind, it has been associated with a life-giving force. In many ways the sun is the very essence of nature. So it shouldn’t be surprising to see this symbol crop up frequently in packaging and advertising for processed foods. But is the Sun Chips story really so sunny? Unfortunately the answer is “no.” Although Sun Chips may be healthier than some of their salty snack brethren, that really isn’t a very hard mountain to climb. With 140 calories, 6 grams of fat, and 120mg of sodium in a 1 ounce serving, snacking regularly on Sun Chips probably will lead to some long-term trouble. And when you consider how few chips there are in a 1 ounce serving (see below), you realize that an average Sun Chips snacking session is likely to have at least two or three times the calories, fat, and sodium. Whole corn: If you’ve been reading my “All Natural … Really?” series very long, I’m sure you guessed it–this is GM corn (genetically modified)–hardly all natural in my book. Natural Flavor: This sounds like an innocent enough ingredient, but as Eric Schlosser points out in his book Fast Food Nation, “The distinction between artificial and natural flavors can be somewhat arbitrary and absurd based more on how the flavor has been made than on what it actually contains…. A natural flavor is not necessarily healthier or purer than an artificial one.” Natural Flavors are also closely guarded secrets of manufacturers and flavor houses. My request for more detail on exactly what is in Sun Chips’ natural flavors has yet to be answered, but rest assured, if it’s revealed, it’s most likely a list of complex chemical compounds that would double or triple the length of the ingredient panel. Maltodextrin: In the case of Sun Chips, maltodextrin has been enzymatically derived from GM corn. The result is a bland to slightly sweet additive that is a staple in processed food. To me, maltodextrin is to starch what high fructose corn syrup is to sugar: a highly processed, man-made concoction that bears no resemblance to its raw ingredient forebears. Although it is easily digested by most people, if you’re having gastrointestinal issues, monitor your consumption of maltodextrin since in some cases it has been known to cause extreme GI issues. Never eat out of the bag, it’s just too dangerous. If you’re going to indulge, get out a small bowl and control your portion. Try replacing a serving or two a week with a serving of cut up veggies. Then each week, replace another of your salty snack servings with veggies until you’ve reduced your addiction to an occasional treat. A piece of fruit like an apple is also a good replacement option. Good quality nuts are also a good alternative. But you’ve got to remember, nuts are packed with calories–a little goes a long way. So don’t go bingeing on the whole bag or jar. High Fructose Corn Syrup: All Natural Really? Are you confused about high fructose corn syrup (HFCS)? I’m not, but I’m convinced the manufacturers of HFCS are trying to confuse us, despite what they might say. But confusion is one of the tried and true tools of the processed foods industry. Their tactic: if consumers don’t know what to believe, chances are they won’t take steps towards change–especially if it’s inconvenient. So, let’s try to set the record straight. The truth is, HFCS is anything but natural. Unfortunately, as we’ve learned time and again in my “All Natural…Really?” series, “natural” has become a meaningless claim that processed food companies use to confuse consumers. For example, in the case of HFCS, it’s made with genetically-modifed corn. HFCS is also the result of an extraordinarily intensive process involving a series of enzymatic and chemical reactions. In fact, as one pro-HFCS group states, “the corn undergoes so much processing, and the products of the processes are so removed from corn that there is no detectable corn DNA present in HFCS.” Is that supposed to make me feel better? It doesn’t, but it confirms for me that HFCS is no where near what I consider natural. To top things off, apparently the FDA isn’t too fond of how CRA is renaming HFCS “corn sugar” and their advertising tactics. According to a MSNBC report, the FDA has warned the CRA that ‘Corn sugar’ is false advertising. Eliminate as much HFCS from your diet as you can. HFCS is in everything, so it’s going to be hard, but do your best. If you’re interested in learning more about corn and the secrets Big Food is hiding about corn and HFCS, I highly recommend the movie King Corn. I’ve included a clip from the movie below, but it’s totally worth watching the whole movie (check it out on Netflix here). Finally, if you need a laugh after all this, check out Saturday Night Live’s spoof of the CRA’s “Party” ad. It would be funny if it weren’t so true. You can see this video by clicking here. As always, if you enjoyed this post, share it with your friends by pasting a link into your Facebook feed, liking it, or emailing it to a friend. And for more inside scoop on how the food industry’s trying to fool us, subscribe to my blog here.